Let me tell you about Keith Gray. Eight years ago, on our seventh and last day of our first Edinburgh Book Festival, Daughter and I happened upon Keith Gray signing in the children’s bookshop. 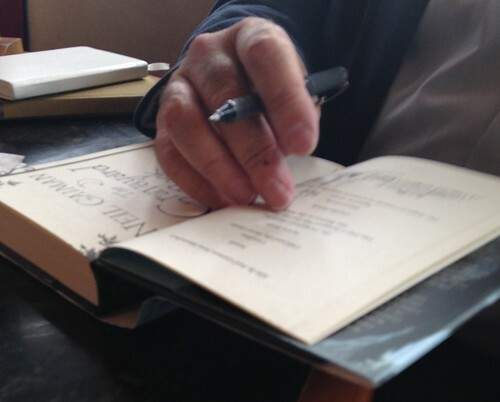 It had been a bit of a learning curve for us, and we realised when we discovered Keith sitting there, that authors might be there even if we hadn’t gone to their events, and even when we didn’t know there was an event. Back then I was less shy about being forward, so walked up and introduced myself, and we had a nice chat. Over the years Keith has tended to pop up in Charlotte Square at some point, and there have been other Scottish-based events as well. 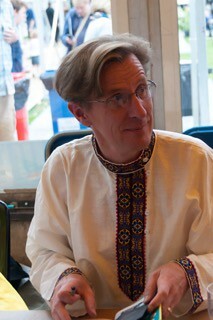 But ever since that day – the 26th of August 2009 – in my mind he has personified the happy coincidence of the bookfest. 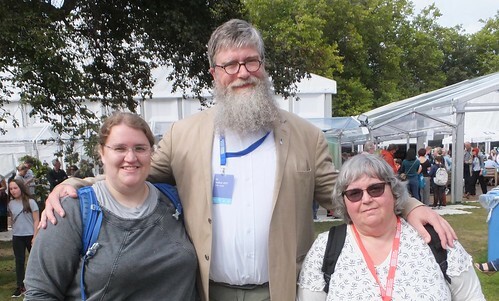 Yesterday was also the 26th of August, and Keith and his family had organised farewell drinks in Charlotte Square, for their many book friends, because they are moving away from Scotland. It was lovely of them to do so, and they will be missed. Much less coincidental popping in future, I suspect. So, it was especially nice that Daughter was able to be there with me, freshly extricated from the Andes. 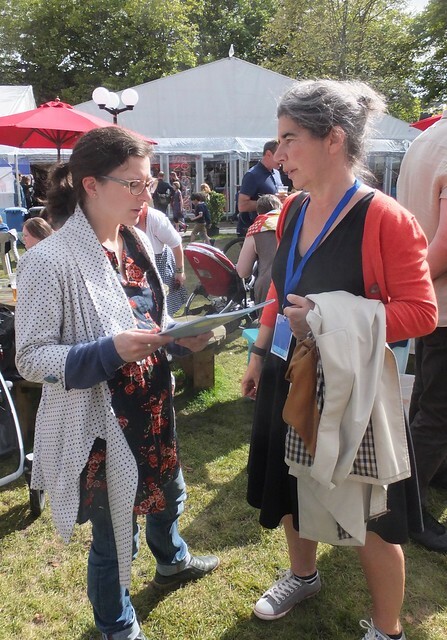 She was able to say hello to Frances in the press yurt, and – oh, how convenient – she was able to take photos for me as I had an interview to do. I’m nothing but an opportunistic user of my nearest and dearest. 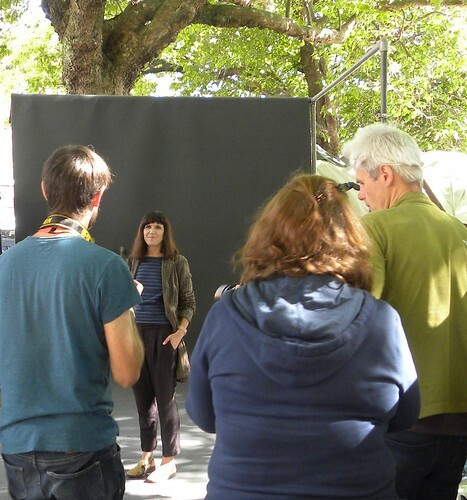 We’d already spied Michael Rosen, and I’d caught a glimpse of David Melling with Vivian French as they walked over to the Bosco Theatre (which meant I missed out on their signing in the Portakabin) for an event. The signing no one could miss was Julia Donaldson’s, still taking place right next to us in the greenhouse, a couple of hours after her event. I believe that after this we managed to fit in eating our M&S sandwiches, before keeping our eyes peeled for one of Daughter’s heroes; Catherine Mayer of the Women’s Equality Party. We searched out some shade after this, enjoying a wee rest next to the Main theatre, where we were discovered by Kirkie and Keith C and chatted before they departed for home. 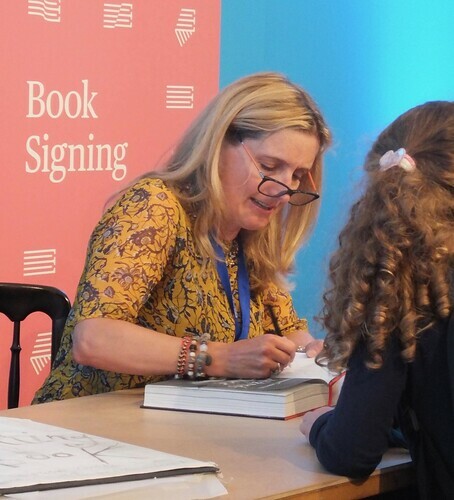 Noticed Gill Lewis at a distance as we sped across the square to find illustrator Barroux in the children’s bookshop, and then straight over to the main signing tent for Cressida Cowell. 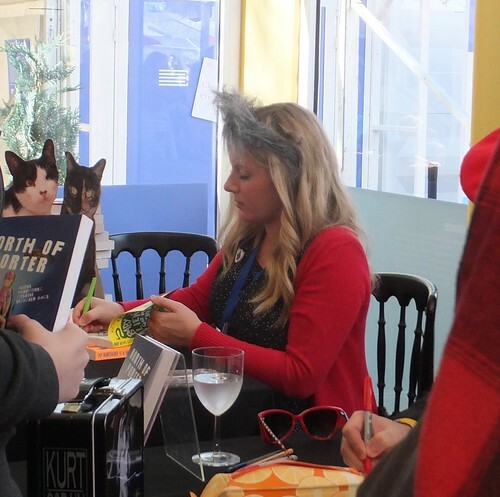 Her signing queue was most likely of the two-hour variety, and necessitated the services of her publicity lady as well, so no chat for me. 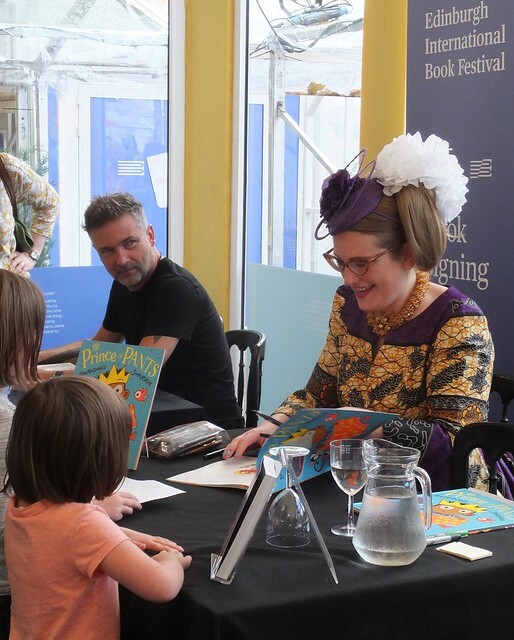 And as it seemed to be a day for dressing up, we lined up to see Sarah McIntyre sign, in her queenly outfit. You can join her but you can’t beat her. Barroux, who was still there, seemed to think so, as he stared admiringly at Sarah. After all this to-ing and fro-ing we had covered all the signings we had planned for, and we went in search of the drinks party out in the square. Debi Gliori was there, before her own event later in the afternoon, and she and Daughter had a long chat, while I talked to Keith Gray himself. He introduced me to a few people, including debut author John Young, whose book I luckily happen to have waiting near the top of my tbr pile. 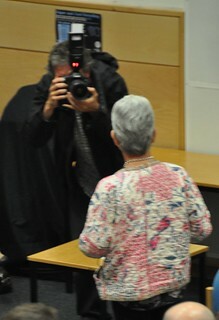 Philip Caveney and Lady Caveney turned up, and so did a number of other people I knew, but mostly people I didn’t. We were all charmed by a lovely young lady, who spent most of her time smiling and playing on the grass. If it had been socially accepted, I reckon Daughter might have taken her home with us. We’d never have got away if we hadn’t had a train to catch, so we got away, and the train was caught, but not before we’d encountered Jackie Kay on the pavement outside. Seemed fitting, somehow. 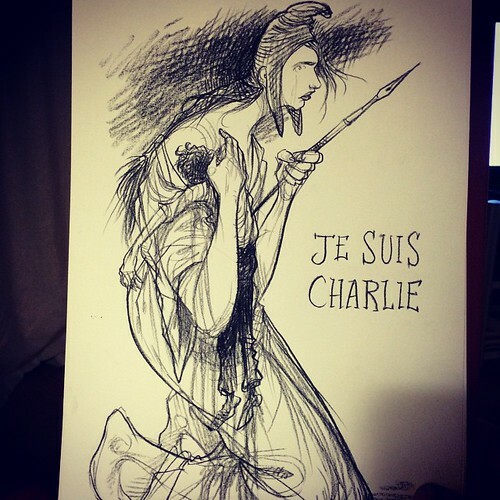 When my window situation prevented me from seeing Chris Riddell in Edinburgh three weeks ago I was a bit upset. But when Chris came to Stirling yesterday – which I have to say was awfully convenient – I was happy again. I wish people would do this more often. 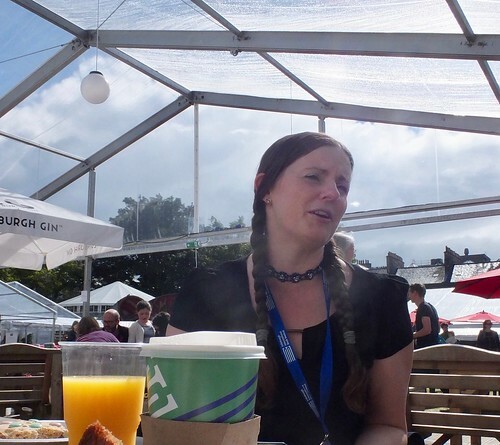 And then – me being me – I spent the morning wondering why I do these things; blogging in general, and arranging to see Laureates in particular. I can tell you why now. 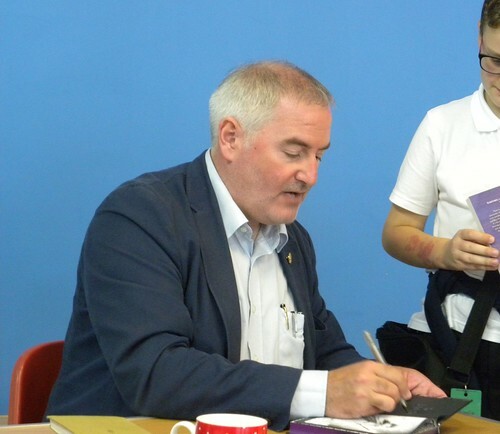 It’s because people like Chris Riddell are so very lovely to meet and talk to. They make you feel all nice and warm inside. 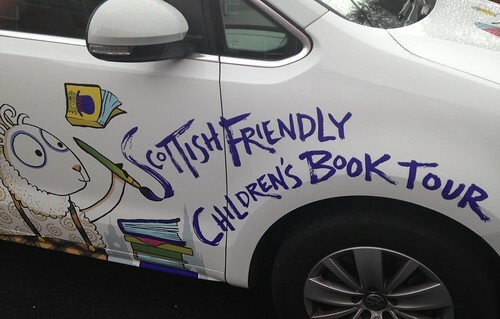 He had been invited by Scottish Friendly to be taken round the country by Scottish Book Trust in their friendly little book van, visiting as many schools as can be fitted into a week. That’s two a day, plus interviews with radio stations and Bookwitches and that kind of thing. I joined them at Riverside Primary where the children were being mesmerised by Chris as I arrived (it’s not always easy to work out how to enter schools these days) and I had some time sitting in on the questions and answers session. They had put answers on cards in a cheerfully lit box, and Chris drew some cards to answer, and then he drew the answers on a thingummy which enabled everyone to see his hand and the drawing on a big screen on the wall. 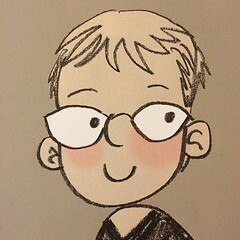 Little Cameron was quite taken when Chris drew him a personal Tiny Vader (really Darth Teddi), and that was after we’d seen [a drawing of] the scalpel that airport security had removed from Chris’s possession the other day, leaving his pencil blunter than it wants to be. 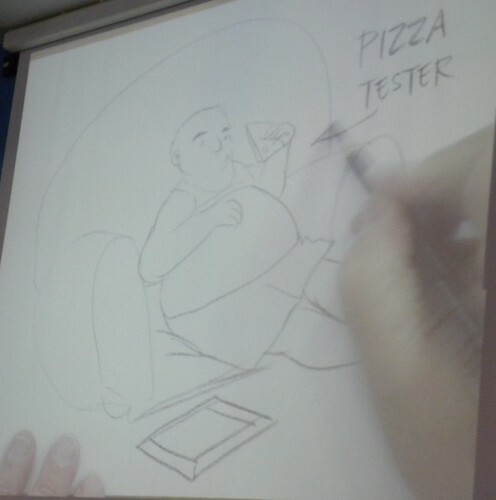 If Chris didn’t draw, he’d be a [fat] pizza tester, and he rather hopes to be drawing until he’s very old (=for ever and ever). 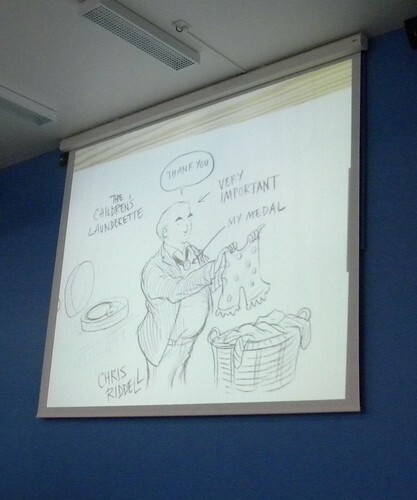 And if that lets us see lots more drawings of his drawers and other garments, that is fine with me. This Children’s Launderette is fun. The session over-ran. Obviously. The queue for the book signing took forever, as it should. Chris gave the children attention and answered more questions. Scottish Book Trust’s Beth ran back to the van for more books when required. 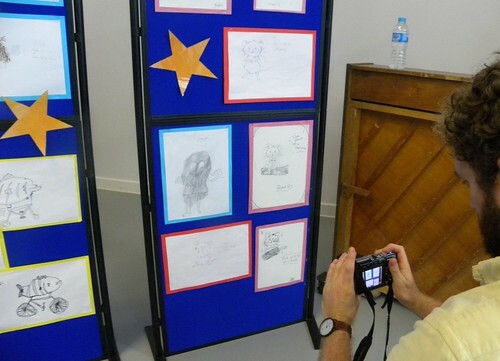 Her colleague Tom and I photographed the children’s own drawings, which were very good. Eventually it was time to squeeze them and me into the van, recently used by, and now decorated by, Sarah McIntyre. Fuelled by enormous chocolate buttons we drove to Toast (yes it was warm), and found they were about to close, but this was quickly resolved by going next door to Frankie & Benny’s, where the old witch had tea, the Laureate drank wine – because he could – and the young ones ordered attractive looking, but dubiously colourful shakes. Yes, I did mention I was interviewing Chris, didn’t I? We got through all the important stuff, like his passion for reading and libraries and their future, before he was to be driven to a live radio interview in Perth. But apparently I shouldn’t feel sorry for him, for having such a busy schedule. Chris thrives on it. So far he’s eaten pizza three times, going from not so good to pretty decent. Somewhere in Perth clearly has a duty to come up with a spectacular one. And then an even better one in Aberdeen. It’s almost that time again. 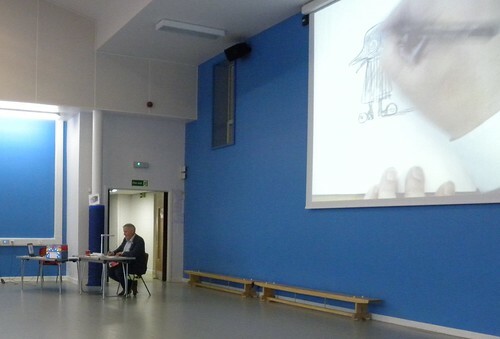 The Manchester Children’s Book Festival launched yesterday. Without me, but a launch is still a launch, and they have Carol Ann Duffy. I like the way they describe their programme, suggesting that if you’re a little bit older than you were six years ago when they began – oh so beautifully! – you might have grown from younger books to some of the older, YA books and their authors. I really like that idea; that you grow up with a festival. And it goes without saying that once grown up you can still never be too old. After all, just look at the festival directors. Do Kaye Tew and James Draper strike you as old? No, I thought not. 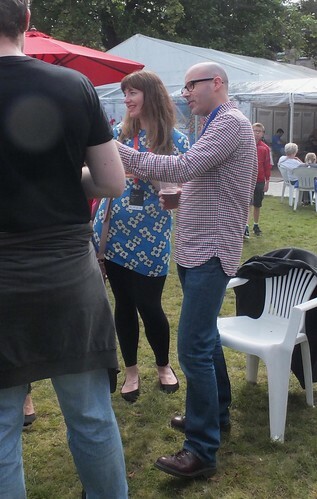 I fear this may be another festival where I miss Sarah McIntyre and Philip Reeve. I have seen them, but they feel like my forever missing act. I don’t even know if I’m going this year. I’ll wait and see if I’m suddenly afflicted by energy, next week, or the week after. They have a lovely patron in Curtis Jobling (I’d like to think I made the introductions, but that could well be fake memory syndrome), so I don’t see how they can go wrong. And I love the fact that on their home page there is a photo of Jacqueline Wilson from a few years ago, with Daughter shooting away in the mid-background, and a virtually invisible witch next to her. We’ll never go away! There’s a poetry competition, with judges of the highest calibre. If I wrote poetry I’d love the opportunity of being read by the poet laureate, and her Welsh counter-part, Gillian Clarke. 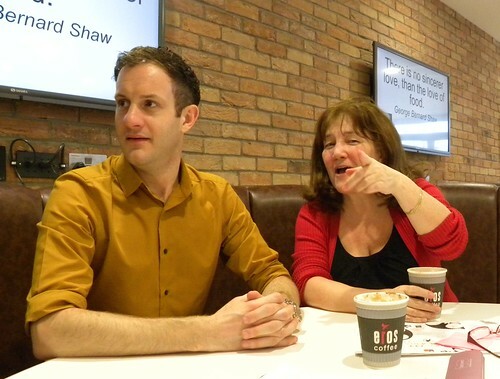 So, for two weekends MCBF takes over various venues across Manchester, including the library and Waterstones, where on the last day you can check out local boy Danny Weston with Sally Green [she’s not a boy]. That sounds good, doesn’t it? 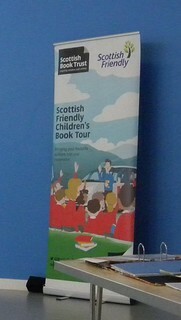 You might have noticed before that the Scottish Friendly Children’s Book Tours tend to offer some really rather good authors and illustrators to schools around Scotland. Their past list reads like a Who’s Who in children’s books. I can’t tell you how excited I was to hear they were bringing Sarah McIntyre here next. 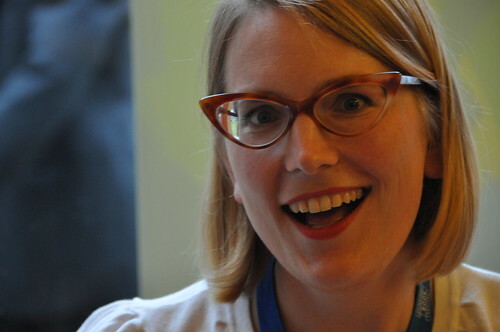 Sarah is both an illustrator and an author. She arrives this weekend, for five days in the Highlands, which in this case means she starts right up north in Thurso and works her way ‘south’ to Inverness. Well, to me Inverness is still pretty north, and this week is pretty full of other things, and I have reluctantly come to the conclusion that Sarah and her Highlands will have to be witch-free this time. But there are ten lucky schools who get her full attention. I am the proud owner of a genuine McIntyre. Digital, but very lovely. I believe it was something Sarah ‘threw together’ on her sickbed, one day when she was too tired to do anything else. She’s made the wicked old witch look quite pretty. Philip wore yellow trousers that would startle polar bears, and a fetching white Cossack style shirt. 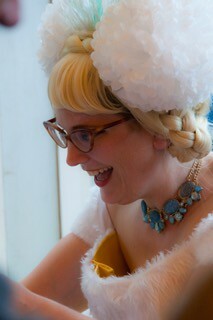 Sarah matched him for yellowness, with a rather lovely fur-trimmed yellow dress. In order to avoid crinkles she’d brought her iron. Their new book, Pugs of the Frozen North, is about a race to reach the Snow-father before anyone else, so you can have a wish. They couldn’t afford huskies, so had to use 66 pugs to pull the sledge (apparently there is a knitting pattern on how to knit your own pug on Sarah’s website). When they mentioned a particle detector for the Northern Lights my personal astrophysicist moaned in despair. This was the first time they’d done the show, so they had to feel their way round (‘couldn’t be bothered’ to rehearse, or so they claimed), but it wasn’t too bad. Philip stole Sarah’s pug at one point, but what is a pug between friends? They made a snow game, riddled with dangers such as avalanches and crevasses, not to mention yetis. Plenty of opportunity for audience participation. There was the snowball throwing, which caused some unfortunate Elvis impersonation, farting and yeti hands, but it wasn’t quite the ‘end of Reeve & McIntyre’ as a member of the audience came to the rescue with their anti-yeti spray. Every performance should have some. We were even taught how to draw our own pug, and it was surprisingly easy. We will be able to take over any day now. There was an inflatable dice, and there was music and singing and an intricate chorus to sing (yip yip yip). They’re crazy. But popular. 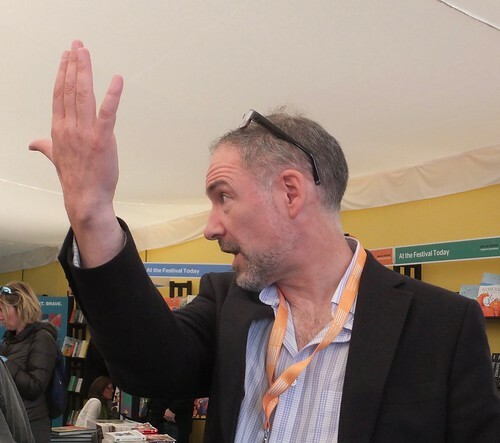 So popular, in fact, that by the time the queue in the bookshop had sorted itself out, I had to give up on making myself known to Philip – again! – as I needed to be elsewhere. And he was so beautiful and yellow, too. It would have been lovely. Do any of you feel like a school at all? 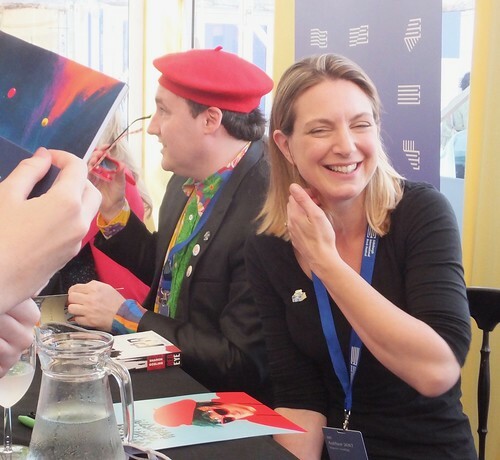 I’m asking because the Edinburgh International Book Festival schools programme was released this week, and it’s what Kirkland Ciccone and others were rushing to Edinburgh for on Friday evening, after the Yay! YA+. 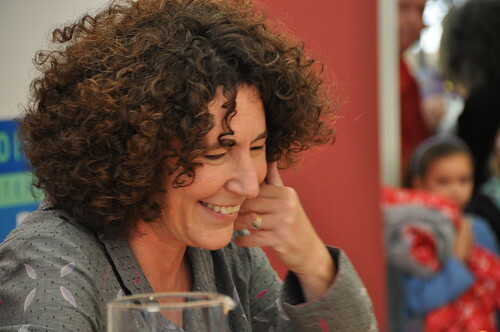 The organisers invited (I’m only guessing here) a group of authors, some of whom are part of this year’s programme, to come and meet the teachers and librarians who might be persuaded to book a session for their young charges in August. And as I keep saying every year; it’s the schools events you really want to go to. Except you can’t, unless you’re local enough to travel and can surround yourself with suitably aged children. But you can treat the programme as a sort of guide as to who could potentially be in the ‘real’ programme, which won’t be released until the 10th of June, and you are forewarned. Or you might be disappointed when you find that your favourite someone is only doing schools this year. But at least they will be there, and you could get a signed book. I’m already excited by the list of great names, even if Kirkland is also on it. I’m no school, though, so won’t be there. 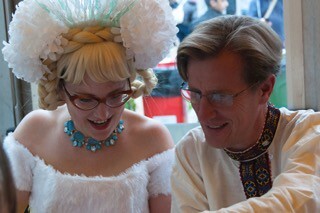 😉 But perhaps this year will be the year when I catch a glimpse of Sarah McIntyre and Philip Reeve. Or Tim Bowler, David Almond or Ali Sparkes. The list is – almost – endless. I’ve already made a wish list for myself of people to look out for, or whose temporary husband I could be. Perhaps. 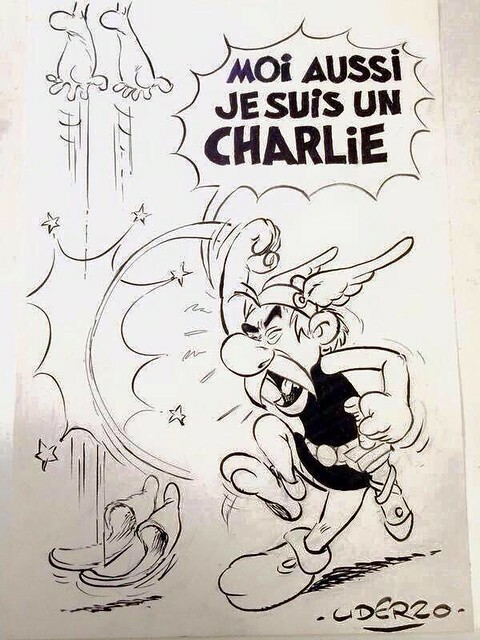 I won’t even pretend to understand what’s going on in France, but it can’t be ignored. Cartoons are something you tend to remember. Pictures stick in your mind longer than a novel might, and any accompanying words will stay with you longer as well. But generally you don’t need words. There are old cartoons that I still ‘take out’ and think about every now and then. Like the (humorous) one of new Swedish prime minister Fälldin in 1976, greeting a surprised Fidel Castro. Or the one of the grounded Russian sub and its defecting sailors in the south Swedish archipelago in 1982. And the heart-rending one by Steve Bell after Dunblane in 1996. It’s very hard to forget. 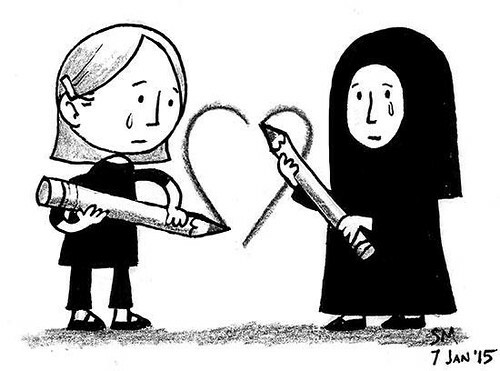 Below are a few I’ve seen on facebook this week, by Sarah McIntyre, Chris Riddell and Albert Uderzo.